…and I put some red details to make my home feel more christmassy too. I’m actually planning to go get all the Christmas decorations from my basement after finishing this post. There’s really nothing as satisfying as finishing up cleaning your home and getting Christmas decorations put up. One of my favorite moments of the whole year. I might surprise you with saying that I’ve planned on blogging every day(ish) during December. I know, from zero to a hundred real quick. I feel like it’s just a good idea right now, and like I’m ready for it. (And to make blogging a more frequent habit again.) The last post I wrote wasn’t probably the happiest, I’ve gone through tough times, and it really took time for me to realize I can get through it. When you have bad times it’s so damn hard to see further and to remember that it will pass. It will always pass and everything will be more than okay. ^Me right now, preparing posts for this week. Thank you all for the amazing comments you have left me, I appreciate them (and you) from the bottom of my heart. Happy Decembre and Happy Holidays! Always looking beautiful, looks like you are doing betterand the big chunky scarf is so cozy for the weather too. 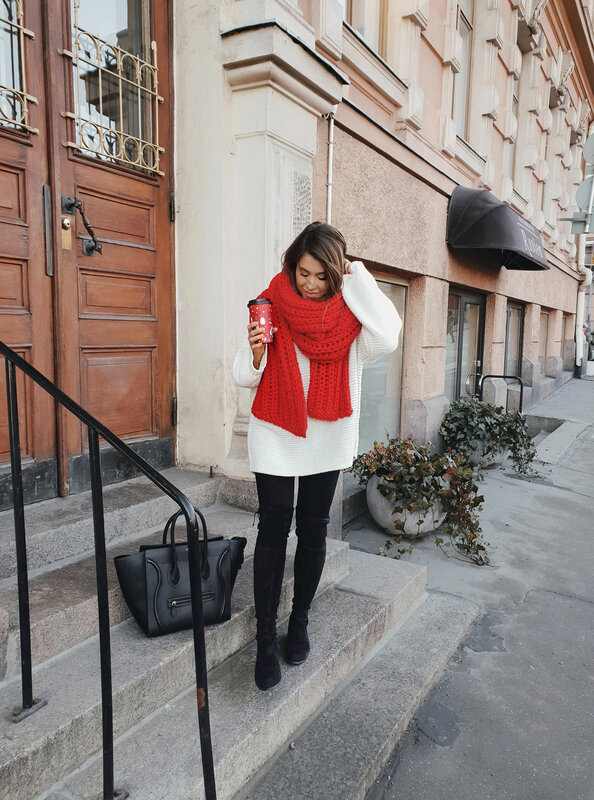 Perfect outfit for the start of the holiday season! The red scarf suits you so well! So so happy to see you smile and read your hopeful words! They are so true! Have a wonderful sunday and I’m super excited for all of the christmassy posts to come!! Wow this looks so great and cozy! Have a happy first advent girl. first of all I am sorry for your loss and all the hard times you are going through right now. And no one of your readers can actually can blame you for taking a break from blogging or social media at all. It’s your life and your job and you can do whatever you want. We all have been trough something like this before and we all understand how you must feel. So take all the time you need! I haven’t commented for such a long time but I am still reading your blog. I just got back from NYC where I spent my 30th birthday, such a magical city. And guess what? I am currently baking your famous brownie cheesecake. Everyone loves it, so it’s kinda of a tradition to do this cake every year on my birthday. Take care Marianna and I’m looking forward to your December posts. Aaaaaa Im so happy that you’re doing blogmas again this year! Can’t wait for every single post! So happy to see you back again!!! So many things I love about this post! 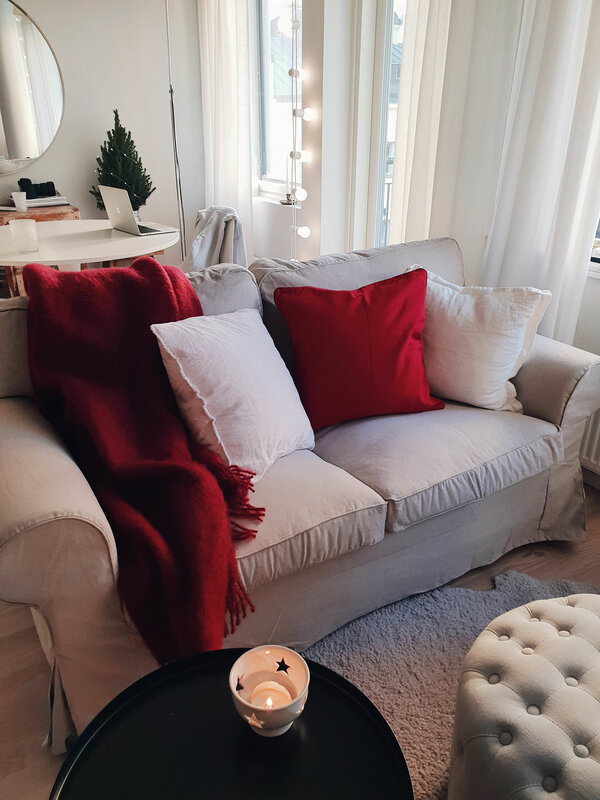 Love the red pillows, love hearing that you are getting through the tough times and feeling the happy, cozy Christmas spirit, love that you’re planning to blog a lot this month! Love all these things! Looking forward to your christmassy blog posts! So happy to hear you’ll be back to blogging in December. I always enjoy reading your posts. And the Christmassy ones are my favourites.